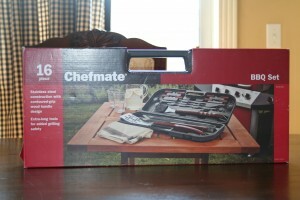 If you get this giveaway correct, you can own this 16 piece Chefmate barbeque tool set, which comes in a handy case to keep it all neatly stored. Today you need to share with us why we chose this gift to go with Mike? Do you know? Shoot us a comment. Ruby Hsu is the winner of the barbeque set. We hope you have fun grilling with these great tools. Congratulations. We will be emailing you for your shipping information. Mike always seemed to be outside at his grill almost every scene he showed up in the book. Mike is always grilling out. Mike invited Rose and Joe over to work things out with his wife, Violet, (Rose’s sister) and he was grilling dinner.